Cyclone and heavy weather are not unheard of ! ~ the Southern States know them too well. Some records of Geological survey of India indicate that the southern part of Dhanushkodi township sank by almost 5 meters during 1948 due to tectonic movements. But something worst happened later (23rd Dec) in 1964 – a cyclonic storm wiped out part of the Nation and took away Dhanushkodi from the Indian map. It is stated that it was the formation of a depression with its centre at 5N 93E in South Andaman Sea on 17 December 1964. On 19th December it intensified into a cyclonic storm. On 22 December it crossed Vavunia of Srilanka with a wind velocity of 150 knots (280 km/h), moved into Palk Strait in the night and crashed into Dhanushkodi of Rameshwaram island on the night of 22–23 December 1964. It was estimated that tidal waves were 8 yards high when it crossed Rameshwaram. Fatefully, train No.653, Pamban-Dhanushkodi Passenger, a daily regular service with 110 passengers and 5 railway staff, was hit by a massive tidal wave near the Dhanushkodi station and was washed away killing all its passengers. While the state capital Chennai was not affected by Gaja, a rare Blue Button Jelly Fish variety has been spotted at a city beach, compelling environmentalists to believe that it could have been an effect of cyclone Gaja. Enthusiasts and wildlife lovers have been thronging to Chennai's Marina beach to see the beautiful creatures. According to information available in the open domain, the fish, also called Porpita porpita, are a different type of jellyfish, a colonial creature made up of hydroids. According to multiple reports, the fish variety was also spotted at the Jersey Shore after the Hurricane Florence receded in October. They were again spotted in Mumbai after August 2017 floods. This is reportedly the first time that they are being spotted at Marina beach in Chennai. Tamil Nadu Chief Minister Edappadi K Palaniswami met Prime Minister Narendra Modi on Thursday and sought central assistance of Rs 15,000 crore for relief and rehabilitation work for the destruction caused by Cyclone Gaja in the state. According to the memorandum, the state government has sought Rs 14,910 crore towards permanent renovation activities, including in the power sector which lost crucial infrastructure in the cyclone. Mr E Palaniswami said that Modi, responding to his request, deputed a central team to assess the damage caused by the cyclone. The state government released Rs 1000 crore for immediate relief and rehabilitation efforts in the affected areas. Chief Minister said a total of 3.41 lakh houses were damaged, while 1.04 lakh heads of cattle and birds perished in the cyclone. Noting that as many as 11.32 lakh trees had been uprooted, he said 7.27 lakh of them have been cleared. Around 3.78 lakh people were lodged in 556 relief camps, even as relief and renovation work was on, he said. Supply of electricity and drinking water was being gradually restored, he added. Meantime, a division bench of the Madras High Court has ordered notice on another PIL petition praying for a direction to the Tamil Nadu government to assess forthwith the damage caused to the property, crops and livestock of the people in all villages in the delta districts, which were devastated by Cyclone Gaja on November 16 and 17 last and grant suitable compensation. The interim prayer seeks restoration forthwith the electricity supply in all villages in the delta districts of Thanjavur, Nagapattinam, Tiruvarur and Pudukottai and distribute the relief materials on a war-footing. 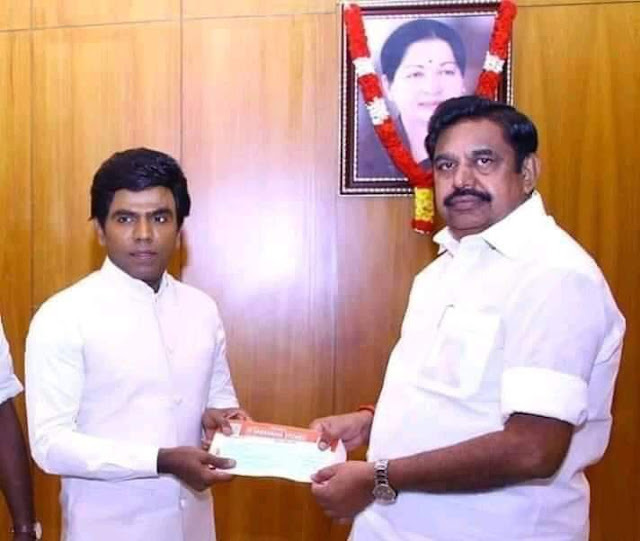 Industrialists, political leaders and actors called on Chief Minister Edappadi K Palaniswami and handed over their donations to the relief fund. Legend Saravanan, chairman of Legend Saravana Stores and MV Muthuramalingam, chairman, Velammal Educational Trust have contributed `one crore each. Duty is cast on those who memed on Savarana Stores owner dancing and those enjoyed such fun, to heartily appreciate the generous gesture of Saravana Stores and all those who are doing their mite in relief work.